Last weekend we had a long weekend due to Children's Day and Buddha's Birthday. 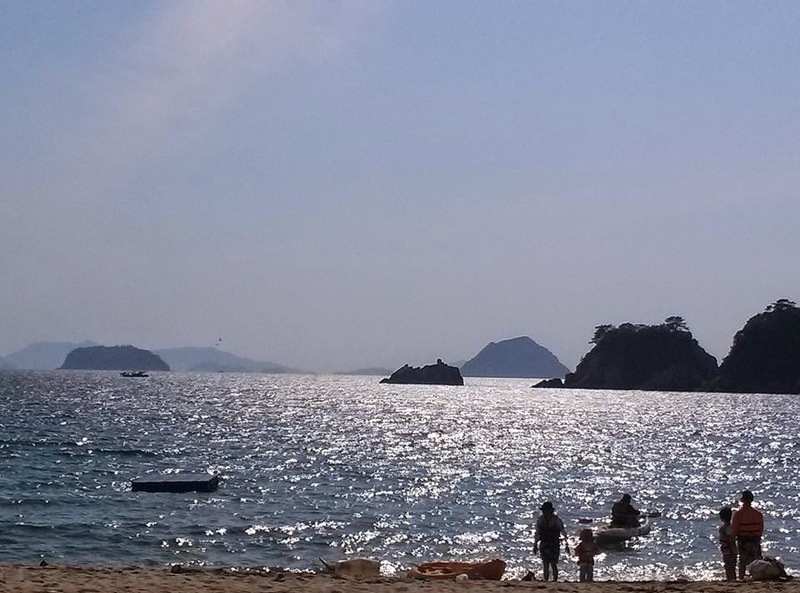 Just about every teacher and student had been eagerly awaiting this long weekend, and I had been especially looking forward to it because of the trip we had planned to visit a small island named Bijindo. All I had to do was look at some pictures of this island and I knew I wanted in on the trip months ago, and at long last the time finally came to pack my bag and set out on the journey to Bijindo. The weekend started as soon as the bell rang at school at 5:00. I bolted out the door as quickly as I could, rushed home to drop off my school bag and replace it with my weekend bag, and did my best speed walking across town to make it in time to meet up with my friends for the 5:40 bus to Daegu. After a bus ride that turned out to be longer than expected, we didn't arrive in Daegu with quite the cushion of time that we had been hoping for. Once we got to Daegu we had to take a taxi to a different bus terminal, which wasn't quite the speedy process given the Friday night traffic. Once we finally got to the bus terminal, we had missed the 8:00 bus to Tongyeong, so we had to stick around and wait for the next bus, which didn't leave until 11:20. All in all, I was ok with it because I was starving at that point, and was happy to have some time to get a bite to eat before getting on another bus. Finally, we got on the 11:20 bus and less than two hours later we reached our destination of Tongyeong. Since it was really late by that point, we found the nearest motel and promptly crashed for the night. The next morning we headed off to the nearest E-Mart to stock up on food for the weekend. Bijindo is such a small island that there's only really one restaurant there and one or two VERY small stores, so we had to buy just about everything before taking the ferry to the island. After doing some serious damage at E-Mart, we met up with the other Jeomchoners who were accompanying us on the trip. We took a taxi to the ferry terminal and after a little wait we were on the ferry to Bijindo. 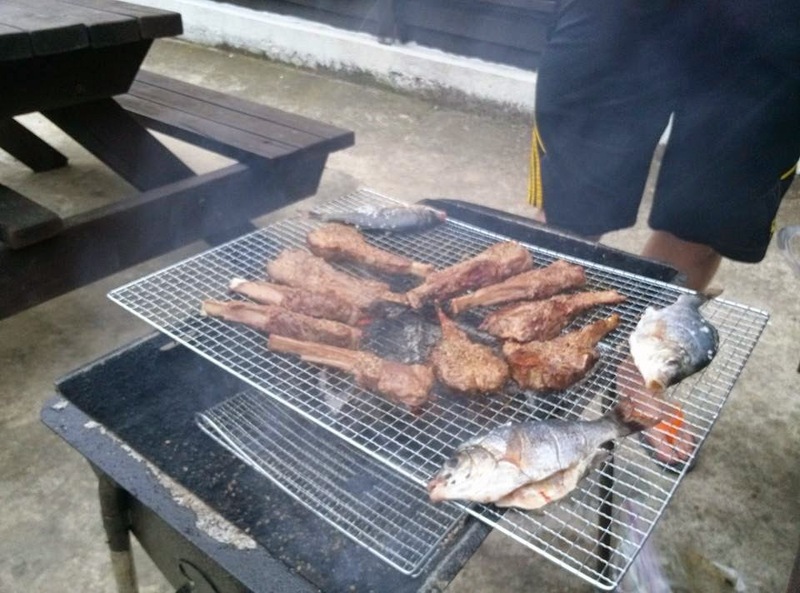 We arrived at our pension in the afternoon, and after taking in the amazing views for a bit we began our first braai (South African BBQ), which included lots of awesome food. After eating way too much food, we spent the remainder of the evening hanging out. It wasn't a late night though--we were all definitely ready for some sleep. Sunset on our first night. The next morning we decided to explore the island a bit. We walked along some roads with beautiful views, and eventually found the small town part of the island. And by small, I mean VERY small. We could tell they don't see many foreigners around there because everyone we came across was eager to talk to us. Talk about feeling like a celebrity. When we stopped at a small place for some coffee, one man suddenly came up to feed me a piece of seafood that he was holding with his chopsticks (yes, this is a Korean thing. It's kind of a polite thing to feed someone else food). With no other choice, I opened up wide and hoped that whatever I just ate was at least dead. Although the sea critter wasn't moving, let's just say it wasn't the most delicious thing I've ever had...but I guess it's the thought that counts. As we continued our walk we came across a small school. We're not entirely sure if it's still in use, but there were tons of local kids playing outside in the yard. Yes, this is at the entrance to the school. Very interesting. The school. Can I be the NET here? Unfortunately, the rest of the afternoon was pretty cloudy, but I was still happy to spend some time reading on the beach. We had braai number two for dinner, which was just as awesome as the previous night's. This time we were also given some fresh fish by one of the Koreans. Although I'm not a huge fan of seafood, it was once again just another example of how generous Koreans can be. After dinner, we spent the night hanging out, but went to bed early, as we planned to watch the sunrise the next morning. Our sunny morning turned into a cloudy afternoon. The fish that were given to us. The wonderful thing about Bijindo was that we had the ocean on both sides of us, making it a perfect place to watch both sunrises and sunsets. Although it was still cloudy on Monday morning, we still saw a pretty decent sunrise. It's not everyday that you get to watch a sunrise on an island, after all. After our sunrise viewing, we went back to the pension and while some people decided to go back to sleep, I decided to try getting in the shower because the previous morning I had had nothing but ice cold water. I was hoping that if I got up and beat the rush I would get some warm water. I was only somewhat successful in this endeavor, but at least I was up and ready for the day nice and early. After eating some breakfast I headed out with two others for a hike along the opposite side of the island. This was hands down my favorite part of the trip. The hike went straight up the mountain, then back down and around. The views were stunning the whole way along--it was really the perfect morning hike. There's really not much on Bijindo! After finishing our hike, it was time for some beach time. 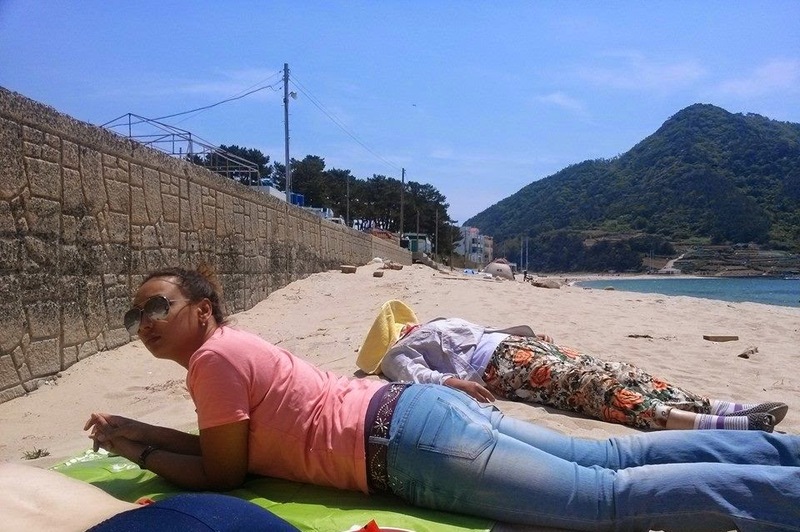 One ajumma had made herself comfortable with two of my friends who were already on the beach--apparently she was shocked by my male friend's really pale skin. She made herself comfortable lying right on the sand, and when I put my towel down on the sand she also told me that I should l just sit right on the sand. If there's on thing I've learned in Korea it's don't disobey the ajummas, so I also plopped down on the sand and made myself comfortable for the remainder of the afternoon. The ajjuma sure did make herself comfortable with us! With the sunshine, vivid blue water, and mountains in the distance, who could be unhappy? There's something truly therapeutic about being at the beach. As two members of our group left that afternoon, it was just me and two of the guys for the last night. We had pre-ordered Mexican food to bring with us to the island (yeah, you can do that), and we had ourselves quite the delicious fiesta for our last night. It was definitely a wonderful way to end our mini-vacation. Sunset on the last night. We were totally exhausted not long after dinner since we had been up since 5 AM, so we were in bed by 9 PM. Yes, 9 PM. I'm really not sure the last time I was in bed so early. The next morning we sadly had to leave--it was time to get back to reality, although I'm sure we all would have preferred to keep living the island life. 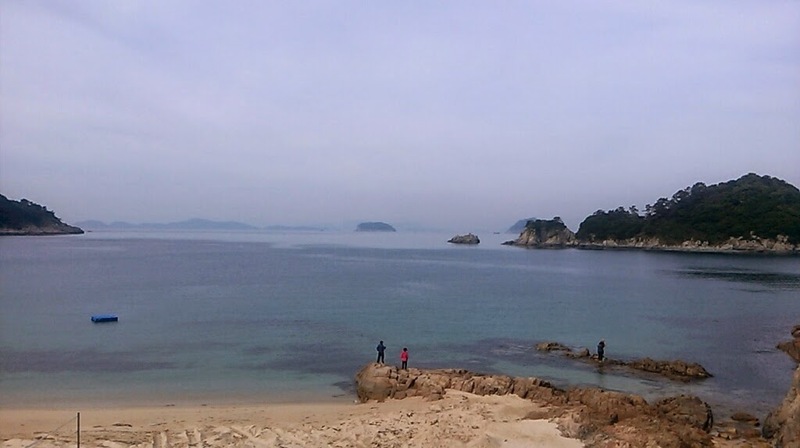 Overall, I have to say Bijindo is one of the most beautiful places I've ever been to. The island was so small and quiet, and pretty much just the perfect place to really GET AWAY from everything. It wasn't a crazy partying weekend, and I am actually really glad for that (am I getting old?) 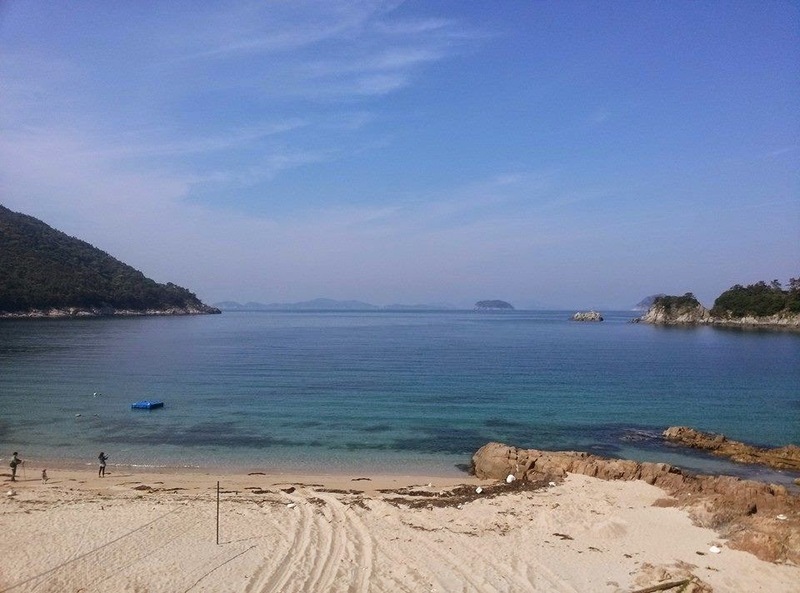 It was lovely to go to sleep with the sound of the ocean in the background, and to wake up with the blue sea and sunshine right outside the window. I was reminded of just how much I love being by the ocean, and of how lucky I am to be able to be in Korea and able to take trips like this. This is a picture of the view from our room. It doesn't even do justice to the beauty of the view.